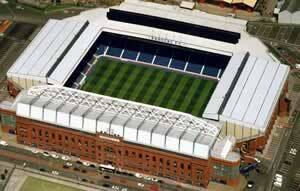 Ibrox is one of only 12 grounds in Europe to have been awarded five star status by FIFA, and if you travel to ibrox, you will see why! The stadium oozes in class much like the side in recent years. Exit the M8 at Junction 23. The road leads straight to the Stadium. Ibrox underground station is 2 minutes from the ground. If you are a registered user then you can login, and create your own personal review of Rangers Football Club - Ibrox Stadium. These reviews can be private or public.